There are two types of people who will go to the cinema to watch Harry Potter And The Deathly Hallows: Part One; the book fan who has followed the films to see how Rowling's novels have been translated to the screen and the film fan who's been introduced to the series via the previous six films. It should be noted that the experience of each of these groups when it comes to watching David Yates' film (his third of the series) will likely be markedly different, certainly more so than any of the other entries. This is because The Deathly Hallows: Part One is categorically a fan's film or, more accurately, a film that dares not alienate its core audience. Therefore, like many of the other entries in the series, the translation from the book is as literal as possible. Hardly any of the characters (none of the key ones) are dropped or changed in any way, most of the action follows the exact same line as the book and the key talking points are all present and correct. If you're a fan of the novels then here's the good news: it's likely that everything you want is included here. If you're not though, or even if you are and want something extra from the films, then the bad news is that this is kind of the film's problem. As a film series, Harry Potter has more often than not struggled to justify its broad set of characters and locations; people that appear for a short but meaningful amount of time on the page just don't have the same depth on the screen; locations which are apparently important don't seem so when we only spend two minutes in them, as opposed to several pages, or even chapters, in the novels. 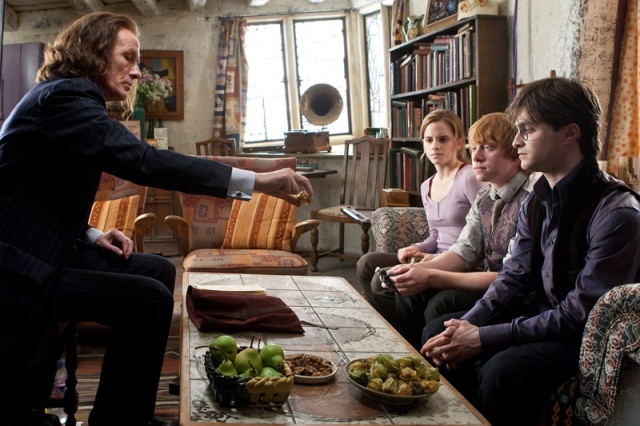 Count up the characters in Part One who only appear for one or two scenes, uttering one or two (or less) lines and you might be surprised at some of the inclusions; Rufus Scrimgeour (Bill Nighy), Molly Weasley (Julie Walters), Ginny Weasley (Bonnie Wright), Severus Snape (Alan Rickman), Charity Burbage (Carolyn Pickles), Narcissa Malfoy (Helen McCrory), Lucius Malfoy (Jason Isaacs), Draco Malfoy (Tom Felton) - the full list is potentially an article all on its own. These aren't 'characters' in the truest sense of the word, they're personas that exist in the meta-world outside of The Deathly Hallows: Part One and as such, on their own, they just don't work apart from to antagonise Harry (Daniel Radcliffe) or point him anonymously in the direction of the next MacGuffin. What this issue skirts around is the dreadful elephant in the room; the splitting of Rowling's book into two films. No matter how hard Warner Bros try to claim that this wasn't for monetary reasons, it's impossible to ignore the astounding numbers. Imagine not just the fact that they can rely on two premieres, two opening weekends and two cinema runs but think of all the other 'twos'; two DVDs, two Blu-rays, two lunch boxes, two plastic wands, two of every horcrux in collectible miniature, two branded costumes - again, the list is huge. The defence for the film that doesn't end is that this is something that has been happening for ages: 'look to The Empire Strikes Back', some people have said, in Part One's defence. The difference is this; The Empire Strikes Back is meant to end where it does - it was written that way, it is satisfying - The Deathly Hallows was not. So whilst there is enough here to keep fans of the series (book or film) entertained, there's not enough here to create a successful film. The narrative feels baggy and unfinished, the action is occasional and diversionary, the dialogue seems to only be concerned with exposition and MacGuffin speak. The Deathly Hallows: Part One is like your average brainless action film: light on plot but containing all the core elements to get your audience excited. Combined with the second film, this could well produce a brilliant epic, it's just a shame that it couldn't be that from the very start. Ha ha. You're right, there's a lot of dark material in this one, including the aforementioned scene! I really enjoyed this one. I'd put it up there with the best films of the series so far. You're not the only one Dan and I've seen plenty of good reviews but it just didn't do it for me. HALF BLOOD PRINCE is probably my favourite although, again, there are many out there that would disagree with that choice too.